The 2019 UNC Charlotte International Festival will be held on Saturday, September 21, 2019 from 10am-6pm. This will mark the 44th anniversary of this annual campus tradition. Please save the date and check back later for updates about the 2019 International Festival! See below to learn more about this program. The International Festival is centered around booths arranged in colorful marketplace style representing the cultures of over 50 nations. The booths are staffed by UNC Charlotte international students and members of Charlotte's international community and feature art, crafts and costumes from each participating country. Many booths offer international food for sale. Festival entry and parking are FREE!!! We highly recommend you consider bringing cash with you to the event. While some booths may accept credit cards, many only accept cash; there are several ATMs on campus, but in past years, the lines can be quite long! Throughout the day the music and dance of a variety of nations will be presented on indoor and outdoor stages. In addition, the International Festival, which is family-oriented, offers a number of elements such as mimes and face painting designed especially for children. In addition to the hallmark elements, the International Festival includes an international games zone for attendees of all ages to participate in and learn about the cultural significance of various games. Participants can learn the rules of bocce, play a game of life-sized chess, or join in a soccer match. Founded in 1975, the International Festival continues to recognize the region's growing diversity. Attendance at the International Festival in previous years has been estimated at over 20,000. 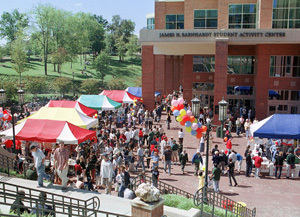 The International Festival is made possible with support from several campus and community partners including Chartwell's College and University Dining Services, Cone University Center, the Office of Business Affairs, the Office of International Programs, and Student Union Activities & Recreation. For more information, contact the Office of International Programs at UNC Charlotte at 704‑687‑7755 or send us a message. Let us know you're interested or invite other to the International Festival through our Facebook Event page. Visit our Flickr site to view pictures from past International Festivals. Special thanks to our campus and community sponsors for their ongoing support of the UNC Charlotte International Festival. For information on sponsorship opportunities and levels, contact the Office of International Programs at 704-687-7755 or globaleducation@uncc.edu.